A while ago, I noticecd the incredible value offered by the S Series Multistrada and began to do some Photoshop treatments of a Multi with Cagiva Elefant and Gran Canyon bodywork. Seemed like a brilliant concept, but the prospect of having to dump all the unused bits from the two owner bikes on eBay just seemed way too much like work (been there – done that), so the project kinda percolated for about 6 months or so. Then I got a look at Floridian Nick S’ naked MTS on the boards last fall and began getting serious about watching for a salvaged MTS DS1000 S.
A nice salvage piece came up on eBay last November and given that I was going to ask Doug Cook (ARC Fabrication) to whip up an undertail system, I had the bike shipped directly to BCM. While I waited for Doug to work his magic, I spent a ton of time pouring through the Multistrada parts book, studying photos, and playing with Photoshop to nail down the cosmetic details and started the process of sourcing all the cosmetic bits. When I saw the photos of the new BMW 650 X-Moto, I knew I had the fairing cased, and began the process of trying to find a dealer who would do the work to try and snag one for me ASAP. 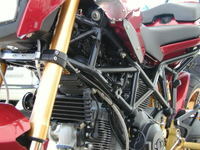 I found that I only had two options for rear sets: Ducati Performance’s ultra expensive, non-adjustable system or modified Cycle Cats. In late November, I stumbled on a set from Parts Planet in Italy at a fair price and after a few emails with Sabrina, placed the order. I was pleased with the final product when I got the set in my hands, but had to modify the passenger pegs so they would fold up. While the bike was at BCM waiting for Doug to do the exhaust, Kyle replaced the valve guides under warranty and ordered a PCIII to optimize the work being done on the exhaust. Doug fabricated a very trick mounting system to move the battery box under the tank and chopped the front off the gas tank with a plan to plastic weld a cover into place. When he hit a wall trying to get the correct plastic code on the tank, he improvised with two aluminum plates screwed in place. I got the call to come down and pick the bike up in the beginning of May and spent a pleasant Saturday AM with him finishing off the wiring and electrics relocation – then it was over to BCM for a full dyno tune with Kyle and Eric. The boys did a brilliant job dialing-in the system and gave me a big, fat torque curve that starts way low in the range. Doug’s system (while a tad on the quiet side) sounds brilliant and delivers lots of punch. 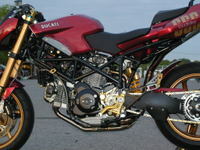 By the time I got the MTS home, I had done all of the ground work and sourced all the bits, so it was simply a matter of stripping the bike and whipping the bodywork over to Chris at Ottawa Valley Custom Paint, the wheels to RLD and the exhaust to Gary’s Custom Cycle for buffing. 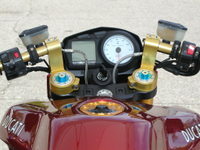 The billet bits had already been anodized gold and Brian at Wolf BMW had managed to bring in the X-Moto fairing bits at the very last minute. While Doug’s aluminum tank end caps did the trick, they didn’t quite match the tank contour, so I carved up and drilled a new set to buff while everything was out for the two weeks of process. 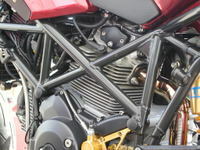 We used K&Ns in lieu of an airbox so there would be room to relocate the electrics from the side of the bike and the vertical filter made an excellent platform for an aluminum plate to mount the ECU, fuse box, PCIII and assorted relays. A small aluminum vertical support gave me a mount for the rear coils while the front coils bolted to the battery box. Canadian Tire’s finest satin finish engine paint went onto the engine side covers, rocker covers and cam blocks and I trimmed down the ignition switch cover to accommodate the repositioned instrument pod and fairing brackets. 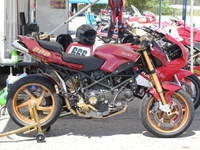 I absolutely love the finished product – and so did the Ducati Owners Club of Canada, who awarded the MTS the Bellisimo (Best Ducati) award at the Mosport Festival last weekend. 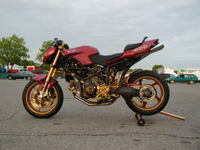 Although I get a nose bleed every time I ride it, I’m in love with the motor, the riding position and the plush ride. Handles brilliantly, and should be able to soak up the crap pavement and countless speed bumps we suffer up here in the Nation’s Capital. My heartfelt thanks to Doug, Kyle, Eric, Gary, Brian and Chris for their creativity and craftsmanship and to Nick for the inspiration.